The Engine Glove is a hybrid multi-material glove which offer high levels of comfort and protection. Soft, lightweight and flexible, the glove has mesh panels for optimum levels of breathability, while the tough synthetic suede leather palm means it is highly durable. It’s also reassuringly protective thanks to the strategically positioned TPR on the knuckles. Another neat feature is the conductive print on the palm and fingers which allows mechanics to operate a tablet while wearing the gloves. 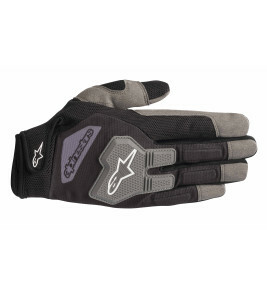 Lightweight, multi-material glove incorporating a stretch mesh and stretch fabric on the top of the hand. Stretch mesh and stretch fabric offer comfort and cooling performance. Synthetic suede palm with padding provides grip, durability and tactility. Advanced TPR knuckle insert offers impact protection without compromising on hand dexterity. Hook and loop grip cuff closure on the back of the hand for a precise fit. Strategic 2mm foam padding on fingers for fit and comfort. Sublimated, fade-resistant color on back of the hand for a distinctive look. Synthetic suede thumb reinforcement for durability and seam reinforcement. Touchscreen compatible fingertip for use with handheld devices.